Eli Whitney made slavery profitable. I’m pretty sure he didn’t mean it. 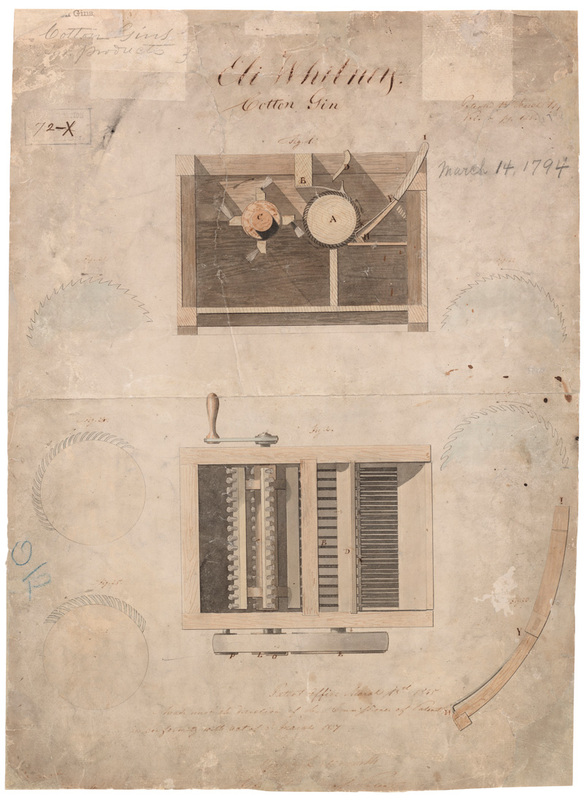 In one of the great “my bads” in American history, Connecticut inventor Eli Whitney received Patent X72 for his cotton “engine”, or “gin.” This device mechanized the separation of cotton seeds from their fibers, which had been an arduous, labor-intensive process. Once considered a luxury item, short-staple cotton became a valuable commodity almost overnight, and it revived a dying institution in the South–slavery. Yet if his patents were respected–which was impossible at the time–Whitney probably didn’t intend for it to be that way. The cotton gins were not originally meant to be sold to plantations to use onsite. Whitney’s original business model (albeit flawed) provided that cotton growers send their bales to his gins in Connecticut, where his machines would process the cotton for 40% of the ginned product as a fee. Most Southern growers resented this arrangement, which smelled of shady proprietorships of grist and saw mills. Furthermore, since patent law was difficult to enforce at the time, it was easily copied by tinkerers and craftsmen throughout the South. In fact, Whitney ate up all his profits fighting patent infringements in court, and his business went bankrupt in 1797. If the system were left as Whitney designed, who knows what would have happened to slave populations in southern plantations. By the end of the 18th century slavery was dying in the North, and was increasingly unprofitable in the South–almost to the point of planters selling all their enslaved Africans and using hired hands instead. Yet the gin, especially the patent-infringed gins that spread on every plantation, made machine-processed short-staple cotton available onsite for massive profits. Cotton became such a commercial boon it tangentially boosted the fortunes of textile mills in New England, Great Britain and continental Europe: Now these “free” places were also tied to the slave economy. Easier processed cotton meant more production, and more production required more hands picking up to 300 or even 400 pounds a day as a quota. The whole vicious cycle spiraled through the early 19th century until the matter was settled with four years of bloodshed. Eli Whitney is not exactly a beloved figure in most Black households. Most likely, he’s burned in effigy with Roger Taney, “Bull” Connor and George Wallace. One cannot know a man’s true intentions, but I don’t think he wanted to expand slavery by building a machine. Instead, he wanted to get rich from a labor-saving device that would revolutionize an industry. Too bad he was such a crappy businessman.